The SMALL CRAFT ROUTE along the east and north coast of Georgina Bay is a stunning route through the 30,000 islands. This part of Georgian Bay rivals the sailing grounds of the Greek Islands for its beauty and challenge. The scenery is breathtaking and the sailing is arguably the most challenging in North America. That challenge comes from the navigation demands placed on the master plus the added element of weather. The SMALL CRAFT ROUTE runs from Port Severn to Little Current on the North Channel through a maze of islands. It offers access to simply beautiful anchorages, hidden coves tucked out of the way, small villages off the beaten path and endlessly changing vistas. This Route has many narrow passages. The shoreline and bottom are unforgiving granite. However, it is well-charted. Start with the Canadian Hydrographic Service (CHS) publication CEN 306 – Sailing Directions: Georgian Bay. Add to that the following charts: 2202, 2203, 2204, 2205 and 2241. It is crucial that you have these charts on board with you. Study them beforehand to get a sense of the Route. Familiarize yourself with the Aids to Navigation, Cautions, etc. Keep them close at hand as you make your way along the Route. The SMALL CRAFT ROUTE is marked on the charts with a solid red line. Along this line, depths 5-6 feet/1.5-1.8 m. However, there may be variations as a result of changing water levels, storms on the Bay high winds, etc. So, proceed with caution. Buoys are numbered, RED with even numbers and GREEN with odd numbers. As emphasized in the section on navigation , NEVER exchange a known, safe position for an unknown position. If you are uncertain about your position, STOP. Take off ALL way and cease any forward motion. Then, take the time to accurately locate your position and then plan a course forward. In addition to the solid red line marking the main Route, you will see a number of dotted red lines. These mark approaches into small harbours and alternative channels. Again, these are well-buoyed. Be cautious using GPS. GPS units can have a margin of error. 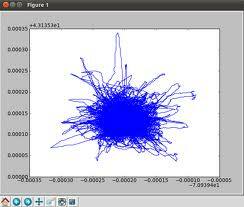 As the illustration shows, your plotted GPS position can wander noticeably. You may not be where your GPS says you are and you don't want to prove that by dragging your keel over a million year old granite boulder – its unlikely to give. As expected, the standard rule in North America of red right returning applies in the SMALL CRAFT ROUTE – i.e. When you are returning upstream from the ocean, you keep the RED buoys on your starboard. BUT . . . you can find yourself crossing upbound routes and then you will see that the buoys have 'switched' sides. (See discussion and example of this in the Kingston port review.) The SMALL CRAFT ROUTE is buoyed up-bound from Port Severn to Little Current. There are literally hundreds of anchorages. Scattered through out this area as small villages to explore. These are not large in number and most offer only basic facilities and services. But hospitality abounds everywhere and many a plain-looking restaurant will serve up an absolutely delicious seafood dinner showcasing Georgian Bay's bounty. Believe me when I say that you will never see all there is to see in one season. The actual number of these islands is well above 80,000! Major harbours on the east and north side of Georgian Bay include Midland, Parry Sound and Little Current at the northern end of the Route, up in the North Channel. Although not on the Route, other major harbours on the southwestern shore include Owen Sound and Collingwood. This is truly a world to discover and it lies within the reach of many many Great Lakes sailors.